Weighing just four pounds, the Haddon LUMBER/MAKER™ is a high-quality, all-steel chainsaw attachment that ensures a straight cutting path. It's like having a handheld lumber mill that attaches to any chainsaw bar in minutes, with no drilling required. Now you can cut great lumber of all sizes and thicknesses for hundreds of projects. We also offer the Haddon WOOD JOINER, which is used to create professional dowel joints. 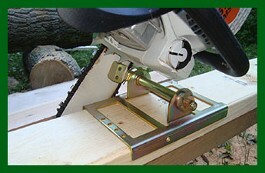 Haddon Tools has been offering quality tools to woodworkers and log home builders nationwide for more than 40 years. Our woodworking tools include both the Haddon LUMBER/MAKER and the Haddon WOOD JOINER. All of our tools are authentic and made exclusively in the U.S.A., by American workers, using American steel. Nothing is imported. Our quality is so good that we guarantee our tools for life! The LUMBER/MAKER was invented and patented by our owner's father, Jesse Haddon, more than 40 years ago (original patent number 3.864.830). The LUMBER/MAKER and the WOOD JOINER are available exclusively through Haddon Tools and our authorized dealers.